Every day office workers, teenagers, police officers, and even joggers just finishing their morning run gather at a popular restaurant in Bukit Bintang. They’re here to eat roti canai – two hot, flaky pieces of fried flatbread, served with a small dish of thin chicken curry. Tearing off pieces of the fresh bread, still hot from the griddle, they roll them up and then dip them into the curry sauce. I thought Chiang Mai had a lot of different kinds of roti – I can order this snack with sticky condensed milk and crispy grains of sugar, filled with cooked egg, or stuffed with sliced bananas cooked to the texture and temperature of lava. Some stands pour chocolate sauce over the roti, or smear it with pandan custard. In Malaysia, though, they fill roti with onions, sardines and sambal, cheese, pork, tuna, lentils, or even sprinkle it with Milo chocolate powder. An extra thin roti is called tissue roti (roti tisu), while a rounder, thicker roti is a bomb roti (roti boom). Roti’s unique texture comes from its flaky, thin dough. Every roti maker has their own techniques, from stretching the dough as far as possible and then folding it over itself, to winding the dough into a “snail” of folded, coiled dough, then flattening it on the hot griddle. Malaysian roti canai is usually fried in ghee, while Thai roti makers usually use cooking oil and margarine. Roti likely came to Southeast Asia from India, where a similar flatbread is called a parota. In Singapore, roti canai is called a roti prata, and roti means “bread” not only in Malay, but in Hindi, Urdu, and other North Indian languages. 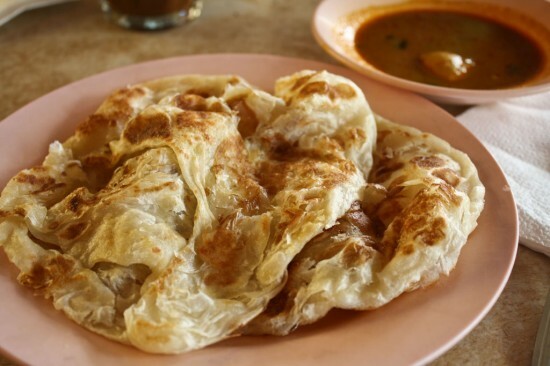 Roti canai is another example of the different cultural influences within Malaysia. 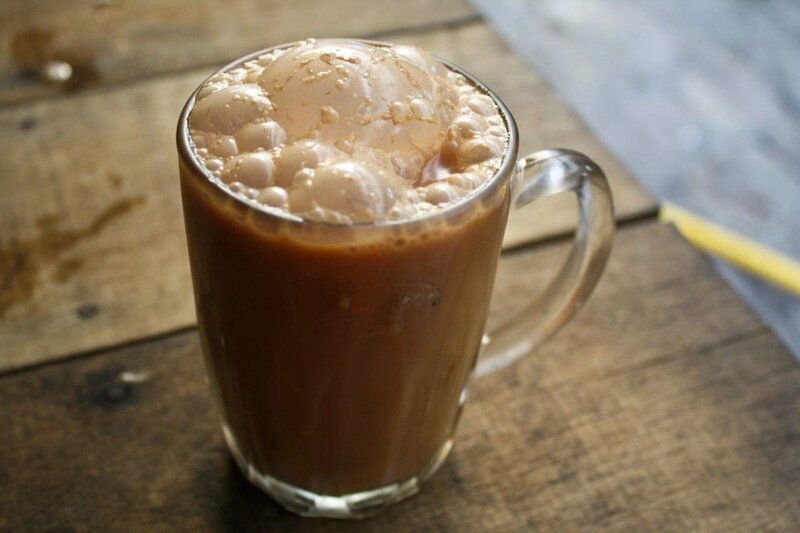 Malaysian pulled tea (teh tarik), is a perfect accompaniment to roti canai, with an equally impressive preparation. The vendor mixes hot black tea with sweetened condensed milk by pouring it back-and-forth between two glasses, usually from a large height. Locals claim that pulling tea makes it taste better, much like decanting gives wine a superior flavor. Pulling tea gives it a delicious frothy top and cools the hot tea to an ideal drinking temperature – it is also really fun to watch. You can make pulled tea with Thai tea and sweetened condensed milk. I’m in Penang, and off now to find a great lunch! If you’ve been inspired to make your own roti canai and teh tarik, check out this recipe and these supplies.